The idea of "Park and Ride " facilities has been around for some years now in Great Britain. It provides the possibility of driving one´s car to an out-of-town area where the car can be parked for long periods,such as all day, or even longer. From there the person can take public transport, bus, tram, train etc. (or even car-share with others), to transfer into the town or city without blocking road space and the town centre car parks for long periods. This, supposedly, lightens traffic on the roads and, for those people who need to enter the town centre, facilitates the ability to obtain car parking space. The schemes have been known by different names and have evolved over the years into different variants, reaching the stage that with the development of HS2 the Parkway stations are not what was conceived but an easy quick-fix to a different problem - i.e. city/town centre access. Many railway stations and airports feature an area in which cars can discharge and pick up passengers without parking. These "kiss-and-ride" facilities allow drivers to stop and wait for short periods, instead of the longer-term parking associated with park-and-ride facilities. For example: this could be the case when a father drops off his children to catch the bus or train on the way to school; or it could mean a wife picks up her husband to take home after he arrives on the commuter train in the evening. Here an anecdote should be mentioned about the event which occurred at Warrington Bank Quay station in February 2009 just before Valentine´s Day. The station decided to put up the sign pictured on the left. The purpose was to stop people from having extended goodbye kisses since such actions were blocking the passage for traffic in the very restricted forecourt. It became a notable/notorious news item on TV channels at home and abroad, in the popular and even serious newspapers, and online. In the car park kissing was permitted. Subsequently,due to the hooha raised, after three weeks, the authorities decided to take down the signs and replace them with a more positive message "Kiss me quick" (on the forecourt) and "Kiss me longer" (in the long term car park). In theory, park-and-ride facilities allow commuters to avoid the stress of driving a congested part of their journey and facing scarce, expensive city-centre parking. Parkway railway stations were set up to provide these services in the suburbs of a town where commuters lived so that they could board trains without having to go into the centre of the town in order to commute to work in the main regional cities. Since the suburbs of British towns tend to be very extensive these Parkway stations used free (or easily obtainable) land near the stations to provide parking places for cars which otherwise would have driven into the centre of the town blocking the car parks all day. The stations could be existing ones on the commuter lines with surplus land - such as freight sidings which had been closed. On the other hand they could also be completely new stations to serve new suburbs. 35 stations are designated Parkway stations at present according to Wikipedia. Bristol Parkway was opened on 1st May 1972. Apart from serving the growing population on the northern side of the city, the idea was to give Bristol a station on the London - South Wales rail line. This was to compliment the services from the city centre station - Bristol Temple Meads - provide easier access to South Wales and offer the opportunity to use the faster trains from South Wales to London Paddington. The concept seemed convincing especially since it has now reached 2.25 million users per annum (2011-12). From this experience all the subsequent ones developed. There are Parkway stations that serve airports. Some are new stations to facilitate access to nearby airports on connecting buses such as East Midlands, Liverpool South, and Luton airport. 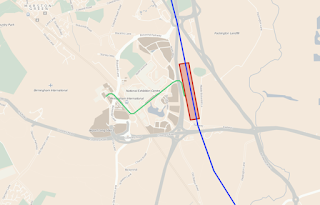 Others are located next to the airports where connection to the terminals can be done with a short walk such as Birmingham International and Southampton. More are constructed to cover and promote future developments such as Aylesbury Vale. Ebbsfleet International serves the HS1 station near Dartford south of the Thames. Tourism in St.Ives(Cornwall) is facilitated by Lelant Saltings. At both ends of the Edinburgh Crossrail there are Parkways at Newcraighall and Edinburgh Park. Didcot and Port Talbot Parkways are exceptions in being close to the town centres. And so on. The concept, however, is the same - to provide parking facilities at out-of-town stations TO COMPLEMENT any existing facilities in the city or town. There is a relative paucity of research on the benefits and disadvantages of park-and-ride schemes, which are often marketed as a way to avoid the difficulties and cost of parking in the city centre, but it has also been suggested that there is "a lack of clear-cut evidence for park-and-ride's widely assumed impact in reducing congestion". There is an interpretation that the establishment of "Parkway" facilities has just changed travel patterns. This is understood to mean that those who would have driven into the city fron their suburban residences now drive to to the out-of-town facility. On the other hand there is another sector of the population who now drive out to the Parkway, or even into the town when they would have taken public transport before. They thus occupy the less full car parks making them as full as before, so the effect produces no benefit.. The most negative aspects are the promotion of road transport, the most noise and fume polluting mode of transport, to reach the out-of-town stations. Trams and buses start from city/town centres. Are we now to duplicate these multiple connections at out-of-town facilities? - I am certain that is not the case.In the city centre the frequency is higher and more varied. Anybody who thinks that the same quality of public transport service will be provided at these Parkways is deluding him/herself. Now that HS2 is being planned, discussed and voted on, there are fundamental flaws with the idea of the stations along the route. The Parkway stations are seen as the way forward to avoid the entry of the trains into the cities (which is actually where people want to go) and thus avoid expensive construction costs. This also makes one think that the alternative of running high speed trains on classic lines into the city centres from the fast lines is just too controversial and would open a Pandora´s Box. This would be a Pandora´s Box since the whole concept of HS2, in the way that it has been designed, would be called into question. Do we really need to construct a 400kph. train travelling in a straight line, and so carve up the landscape while demolishing buildings in its path? That question has already been made about a line which covers only about half the distance of 500 miles from London to Glasgow/Edinburgh. Cannot it be done in sections to improve the existing infrastructure? Or maybe that proposal is too radical. Upgradings/improvements on the lines north of Preston and York would provide much greater benefits on the WCML and ECML routes to Glasgow and Birmingham. 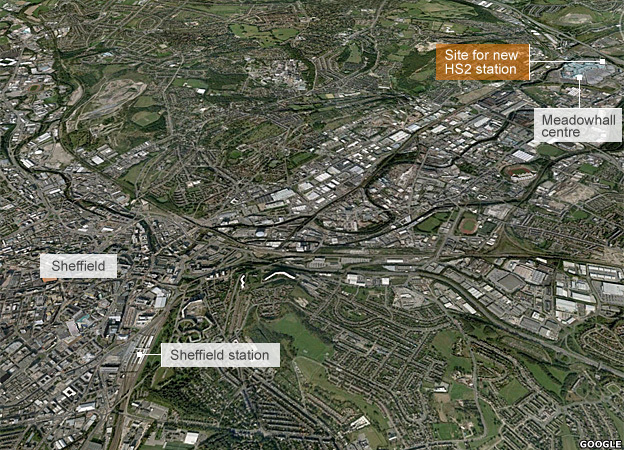 So let us look at the four Parkway stations proposed on the way to Manchester and Leeds. Birmingham Interchange will be 1.22kms from Birmingham International station ("as the crow flies" - atcf). However, since the shortest route will not be direct but along a meandering "people mover"(what a horrible name!!) the distance to be covered to the airport terminal will be 2.5kms. Will it be covered to protect against the elements? What an appealing prospect for an elderly person pulling a case on a late dark night when many fewer passengers( but other doubtfully honest/agreeable ones) are around!!! Is it not much simpler to connect HS2 to the classic line just short of Birmingham International so that it can run on the classic line into the city centre or diverge off to the WCML just after the station. This way there are not only easier connections into the airport but with other services, inter-city, regional and local. 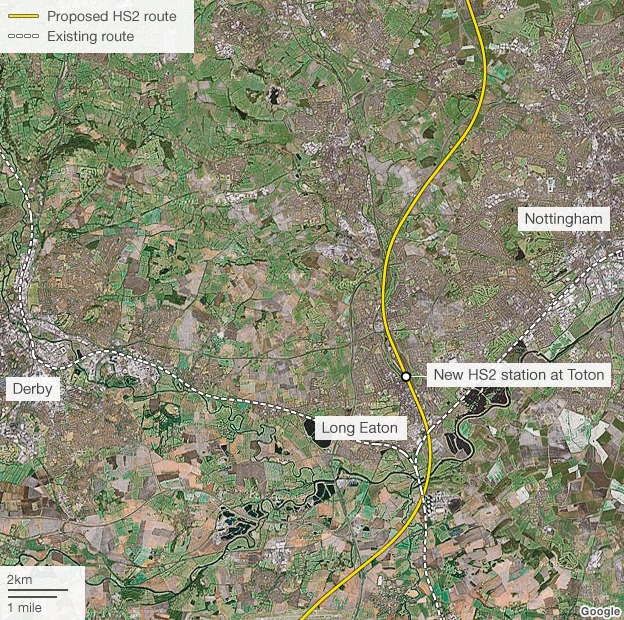 We thus eliminate HS2 Ltd.´s unnecessary duplicating of certain line construction and a second station. Manchester Interchange is in a similar condition as Birmingham. From M/C Interchange to the airport station the distance is 1.67 kms. (atcf) according to my estimates. However, Wikipedia gives a bigger figure of 2.4 kms. The same comments as I have made about Birmingham Interchange apply. Will any walkway or mechanical mover be covered? The same questions of safety apply for late night passengers. 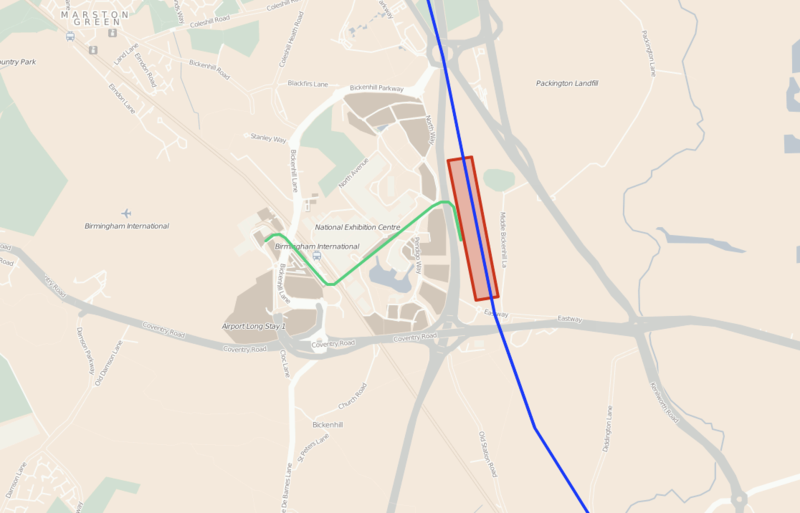 In this case there is an airport station but it could be approached along the existing fast (but uipgraded to 4track) line from Crewe through Holmes Chapel and Wimslow into the existing station at the airport. From there it could then leave westwards, cross the M56 and continue northeasterly on the HS2 route to Ardwick in the tunnel, to emerge just outside Piccadilly, as planned. This way you improve the access to the airport and eliminate the unnecessary, expensive, countryside destroying "new route" from Crewe to Manchester Interchange. HS2 Ltd.´s unnecessary duplication of lines and stations yet again. However, Toton it is, at the moment, since it would be situated in the sidings of the same name west of Nottingham. I do not know which siting would be better but looking at Toton, it is 9.65 kms. from Nottingham rail station while 12.4kms. from Derby rail station (both atcf) - not exactly on the doorstep. HS2 Ltd.(the government agency in charge of the whole project) rather optimistically thinks...." it would be possible for either shuttle or existing services to call at the East Midlands Hub station en route, with a journey time of 12 and 15 minutes from Nottingham and Derby respectively." If that is the case then would it not be more profitable, cheaper, and provide more connections by using the existing East Midlands Airport Parkway? The existing proposals by HS2 Ltd. are duplicating stations providing worse connections yet again. 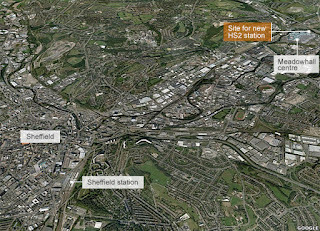 Meadowhall Interchange: the question of this station near Sheffield is different from the other three cases. It is no small distance from the city centre at 5.4kms. (atcf) from Sheffield rail station but at least it is already a train, tram and bus interchange. It that case the infrastructure of other transport modes already exist. Just as important, though, is the fact that travel habits are already in place. People already use the facilities. However, it is still not in the city centre which means a transfer to a train or tram - that is not attractive to passengers with luggage. There are clear indications that the stations for HS2 are not what the travelling public wish for. City(or town) centres are such because that is where all the services have been traditionally placed. The main rail station(s), the main bus station, the town hall, the museums,the art galleries, the main library, the main bank and insurance branches,the main hotels, frequently the best restaurants, often the main sports facilities and sport clubs, the principal theatres, cinemas and other cultural event centres, the principal religious places of worship, arenas for congresses, talks and presentations, and the main commerce, shops etc. Neither Toton nor Meadowhall fulfills that need. Manchester airport Interchange is ridiculously distant from the air terminals it is meant to serve, especially when a little positive thinking could make the line traverse the airport station(with adaptation of course). Birmingham Interchange is also too far from the other station at the airport where it could interconnect with other rail(and bus services) separating and duplicating unnecessarily stations as with Manchester. What would a national HSR network look like? Truncating lines (and services) short at the edge of cities deters passengers and destroys the business case; the advantage over other travel modes is seriously compromised. We have an aim of encouraging sustainable development. The best way to achieve that with transport investment is to enhance the accessibility (and therefore the value of) city centre locations. This is where business and other activity is at its most intense and where international experience demonstrates high speed rail can best support economic growth. Integrating with regional and city plans. The existing rail network may require reconfiguration and investment in certain locations to facilitate HSR, in particular at shared stations to provide new dedicated HSR platforms or on sections of the classic network where HSR services are envisaged to operate, in order to upgrade line speeds, or to provide gauge clearance, for example. The engineering analysis carried out for this study programme has shown that it is possible to construct HSR stations in city centres and thus provide a catalyst to local development plans. In addition to these, there are documents which were prepared by the consultancies, Atkins and Arup, for the Department for Transport concerning HS2 during the first decade of the 21st century and have now been buried in the archives. This was done when the government changed after the election in May 2010 from Labour to the Coalition. It is now extremely difficult to find what you want. It just makes me come to a conclusion that there is information which is "uncomfortable" in those reports. I cannot quote chapter and verse but I do remember that in one report there was a statement specifically saying that passengers do not want to go to out-of-town stations but city /town centre ones. All which supports the conclusions in the Greengauge 21 document quoted above. I fear that this project, HS2, has taken on such a momentum and size that there are too many reputations at risk for any real hope of lucid thinking. The use of classic lines, even into city centres is widespread in European countries where High Speed Trains run - that does not affect their running. In fact it helps the promotion of HS services. To ignore that means that all the the country, the users, the taxpayers, the residents in the places affected, all lose out. It should not be the case whereby there is too much at stake for anybody to climb down. Rational thinking and thus action is what is needed, not political vainglorious posturing. The situation of these stations on HS2 outside the cities is an illustration that they are used to satisfy the needs of stops on the lines but not the needs of passengers. They are designed TO SUBSTITUTE city centre facilities. Originally Parkways were complementary stations to the existing ones, as previously mentioned, to alleviate congestion in and into our towns and cities. Now they are feeble excuses or even sops for connections to the high speed network when other more passenger friendly alternatives exist. For whom are the high speed lines, for the users or for the planners, politicians, constructors and consultants?